Welcome at Maier Heidenheim ! We are happy about your visit at our website. It is our pleasure to invite you to the Maier rotary joint world. Our Mission Where Quality, safety and Experience assure customer satisfaction ! Our mission is to be the first choice for Rotary Joint (rotating union ) customers around the world. As one of the most experienced manufacturers of rotary joints in existence, our priority (goal) is to maximize the quality and value of rotary joint products & services. This is accomplished by integrating our traditional and well-known core values of high quality, reliability, and safety with comprehensive customer and user-driven priorities combined with a solid technological infrastructure based on proven, reliable and emerging technologies. The results are "value-added" products & solutions that satisfy customer needs ! ISO 9001, ATEX 94/9/CE and PED 97/23/CE Quality Policy Statement The Maier advantage clearly results from decades of applied experience and refined quality procedures including being ISO 9001,PED 97/23/CE and for some product series ATEX 94/9/CE registered to meet customer requirements. Additionally, our quality management system is continually improved by meeting and revising quality objectives. Global Presence Branch offices in USA and Italy and a strong international net of more than 40 distributors and agencies worldwide guarantee a global presence with 24 hour spare parts supply in all important industrial countries. Authorized service centres are offering at-sight repair in USA, Italy and Canada. 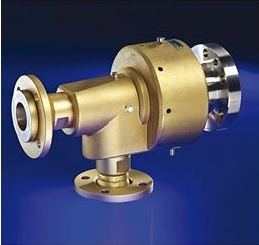 Maier Rotary Joints Rotary joints are components connecting stationary pipes to rotating rollers and tables for transferring media under pressure and to heat or cool a system or to feed the media through for process. Maier Rotary joints are designed for cold and hot water, steam up to 250°C/482°F, 40 bar, hot oil up to 390°C/734°F, hydraulic oil up to 350 bar, air up to 40 bar, chemical media, coolant up to 150 bar, vacuum and high running speeds and temporary "dry run" applications. We offer more than 10 basic series; sizes from 3 to 500 mm. Maier Rotary Joints are utilized in the machine tool, textile, plastic, paper, rubber, food, steel, chemical, and energy industry. We offer rotary joints for: Machine Tools (internal coolant supply), power spindles, Calenders for plastic materials and rubber Calenders for nonwoven products Printing and flexographic machines, gold converting, Textile and tannery machines Paper machines ( super and soft calendars) Rotating dryers/mixers Tobacco processing machines Steel Industry (continuos casting), Food processing machines Chip board plants PET bottle machines/ blow molding machines Rotational/slush molding machines Roofing Felt plants Wind turbines Solar wafer production Clutches Coiling systems Further information you find at Quick Selection. The Experience Rotary joints are often unessential compared to the cost of a machine or line. But they are essential components for the performance of machines in which they are installed. Critical usage configurations require theoretical and hands-on knowledge with a variety of applications. Maier has more than 50 years experience in producing rotary joints. We produce more than 1000 versions of standard and custom-made rotary joints, from single passage to multi passage, from DN3 (1/8") to DN 500 (20"). An extensive laboratory for 24h tests 7 day a week is available and makes new products running well from the very beginning. Repair and Service An extensive repair center is installed in Heidenheim. Failure analysis and evaluation of rotary joints as well as cost offers are part of our service. We offer repair service in our repair center and local support for customer needs.